The original inFamous was noted for being one of the most amazing super hero games of 2009. Not only that, the game threw a Hollywood style plotline, represented by comic style cutscenes. The sequel to Cole’s jaw dropping adventure now returns with addictive powers, gameplay and updated visuals. inFamous 2 is a direct sequel to the original where Kessler had foretold the coming of the Beast. Co-incidentally the game begins with a rather short boss battle with Cole facing against the Beast, but as expected our hero is not all that powerful yet to take out the Beast. Cole along with his ‘old’ friend Zeke flee to New Marais, a place which is inspired by New Orleans. Apparently this is the very place that Ray Sphere was developed, which was the central theme of inFamous. This is your new world where Cole will meet some of the new characters, face off against some crazy enemies, monsters and meet new friends. 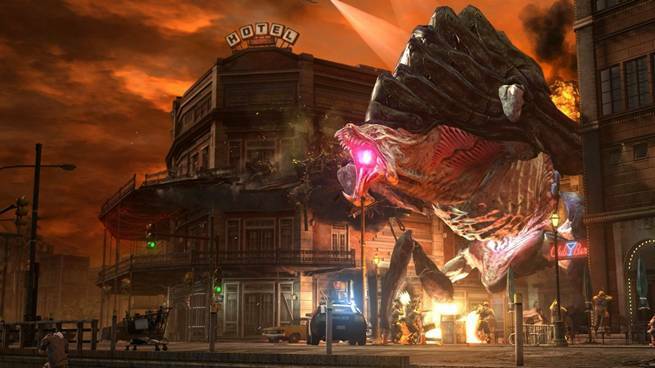 Get ready to face some huge monsters in inFamous 2. Cole will be facing off against the Militia, a group of mad men who have overtaken the city of New Marais. This organization is led by a man named as Bertland. Cole will also face against a second group called as the Corrupted, a breed of people who have been affected by the Ray Sphere. The story is once again represented by comic style cut scenes, an art Sucker Punch is well versed with ever since the Sly days. Overall the plot is one of the highlights of the game, even though it begins on a slow note. Alpha Bolt: This is the power that you will start the game with. Cole will throw electric bolts using the trigger buttons. Imagine Gears of War, but instead of bullets there are electric bolts. Princer Bolt: When you gain this power, Cole will fire three alpha bolts. Nothing out of the box, but I preferred the Alpha bolts more. Alpha Grenades: Cole will lob electric grenades and these things were a ton of fun to use. The amount of destruction this power can cause is pretty surprising. Kinetic Pulse: One of the powers from the original, Cole can push away a group of enemies. This is pretty ideal in cases where you are surrounded by multiple foes. Tornadoes: This was one of my personal favourites in the game, although the element needed to activate this power is few and far between. Ionic Vortex: Cole can lift off any nearby objects like vehicles and debris, ideal if you are taking on a boss. There are literally tons of upgrades, abilities and powers that players can buy off using the experience points that Cole will gain during the game. Additionally players can collect off shards, which are scattered all across New Marais. Collect a good bunch of them and you can unlock upgrades. The only down side of unlocking powers is that the game wants you to complete some compulsory objectives. For example if the player wants to unlock the Blast Shard Sense power, it will require the completion of sixty side missions which might become draining and boring for some players. In my opinion they should have kept it simple and dependant on experience points. Having said that, once you start unlocking the good/bad powers, they are a ton of fun to use, more so than the original. The game features updated visuals and fluid animations. Karma is back in the game and it’s kind of a hit and a miss. I am sure many fans of the original may enjoy the system but I think that there is a lack of balance in inFamous 2. The game throws you a number of decisive moments (good and bad) and some of them fall flat. I found several issues in the Karma system during my time with the game. A good example was one of those missions where I used the Torando power to take down a number of bad guys and also some civilians and still the system gave me a good karma. The same old healing or capturing system returns where you can gain experience and good/bad karma. This may get repetitive for some players and makes the game slightly unbalanced. The mission is structure is pretty simple. It’s the same that we saw in the original only with tons of side missions. Sucker Punch have up their game as far as engaging missions are concerned. One of the complaints that I had with the original was the fact that mission destinations were very far away, resulting in to unnecessary wastage of time. 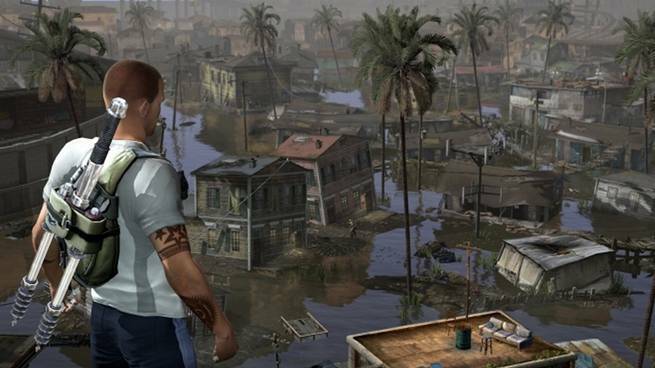 inFamous 2 addresses this issue with nearby mission points which are longer in length and more fun filled than the original. The variety of side missions in the sequel are insane with the game throwing multiple opportunities to save a citizen from the Militia/Corrupted or defusing a bomb before it blows away somebody. The User Generated Content will blossom as the inFamous 2 community grows. inFamous 2 features some really smart enemies. Most of the time you will be facing off against the Militia but when you go through a dense forest or a garden you will be facing off against the Freaks. These guys will run after you with great speed and agility unless and until you or they face death. The sequel has an increased number of boss fights and some of them can get pretty easy or difficult, depending on what powers you have and how you use them. You will be facing off against massive monsters like Behemoth and Devourer, which will take some doing to take them down. Overall Sucker Punch has done a neat job in the enemies department. 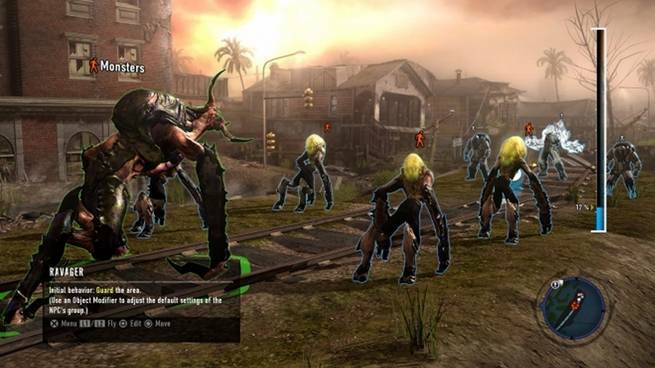 2009’s inFamous was not really a game that was praised for its visuals but the sequel changes that. inFamous 2 runs smoothly with some really fluid animations and a world that is more vibrant and action filled than Empire City. The voice acting is a bit below par in Infamous 2, mainly due to the fact that we missed the original voice actor for Cole. It’s not that the current one does a bad job, but the original character had a real grunt in his throat which made Cole a much more appealing character. The cut scenes are once again intricately detailed and designed and do a super job of telling the story. New to the franchise is the ability for every inFamous 2 player to create their own content, called as User Generated Content (UGC). Players can create their own missions and earn experience points. We played some of the initially loaded content and we are thrilled and excited at the prospect at what the loyal inFamous community has in store as far as UGC is concerned. inFamous 2 has its own share of issues and is far from perfect. It really does not surpass what the original did and may actually get repetitive for some players. 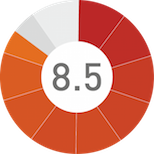 But the game shines through with the same old solid gameplay, enhanced powers and the ability to create your own content. Not to mention the fact that platforming and sliding through the rails never get old. Overall inFamous 2 is a worthy successor to perhaps one of the best super hero games of all time. Cole’s powers are exciting and more effective, Visuals and character models are top notch, Boss battles are intense, Comic style cut scenes are better than before and lot of variation in enemy types. The morality system lacks balance and the game may get repetitive for some players. Cole is back with a bang in this action filled sequel.